From the settings (gear-shaped) icon, select Manage Account. From the Manage Account page, click on Roles and Permissions. From there, you can create a new role, or edit the permissions of an existing role. Click on the Details link to open and edit any role. Fill out the standard information, including the display name (the name of the role you are creating - for reference purposes) along with the description of the role. Under "group access" dropdown lists all of your groups. By selecting a group you will give managers access restricted to people in the group selected. Note that if your campaign managers *create* a group, they will still not have access to the supporters from that group unless they have the group added to their permissions. Under the "Default Dashboard" heading, click on the link that says "Click here to configure dashboards for this role" to see what their dashboard will look like. By default, dashboards associated with a role are locked-down so that the campaign manager cannot edit it. If you would like to grant access so that campaign managers with this role can edit their dashboards, you will want to check the "edit dashboards" box. This will take you to the dashboard with a note at the top of the screen that you are editing that role's dashboard. Click the "Add content" button in the upper right corner to add stickies or reports to the dashboards. When you have finished adding those sections, click the "end editing" link at the top of the dashboard. To test the dashboard, give your campaign manager access to the role. Log back in and select that role from the role dropdown menu at the bottom of your HQ screen. Here you can select which packages (or tabs) you want the user to have access to. Note that if you do not select the "Dashboard Collections" tab, they will not see the standard login page and will see a message that says "You do not have access to this page" - however, their tabs will all work. You can preview what their login screen will look like by clicking on the link in the "default dashboard" box. Here you can limit the user to only have access to objects tagged with a particular tag. For instance, if you entered the tag "whales" the person with this role would only see supporters or other objects tagged with "whales." After you are done creating your role you will then need to apply the role to the relevant campaign managers. First, navigate to the campaign managers page. Click on "details" to edit the campaign manager. Add the role or roles you've created to the campaign manager's account. Super Admin users have access to everything in the account, including account setup privileges. Normal users have access to everything in the account except for account setup privileges. If you apply more than one role to a campaign manager, the campaign manager may switch between them according to his or her current task. Some questions about limiting managers' access to a specific group or groups. Can you give a manager access to more than one group? If the group is a hierarchical group, can I give managers access to the parent and thus they inherit access to the children? Hi Charlotta - Yes, you can give a manager access to more than one group. Parent groups do not automatically give them access to the children, so you'd need to select the parent and each child group for your campaign manager role. If I am a "Super Administrator" do I need o be assigned roles? Seems like I wouldn't but I want to make sure. We're finding that when managers are limited to specific groups they are having issues with entering new supporters. Example: Manager John is assigned a role with access to ABC Group. Manager John adds a new support and, after clicking submit, receives a message stating that "this person does not exist or you do not have access to them." The new supporter is added before that support can be assigned to a group and the manager is restricted from the supporter profile and can not then add that supporter to the intended group. Would it be possible to either include an "add group to group" selection on the new supporter form or to allow managers to access the supporter profile prior? Is it possible to make it so that an Account Manager can view a supporter and add notes and schedule contacts with that donor, but not be able to edit general information such as phone and address? In order: Libero, if you're a Super Admin, you don't need to be assigned any role, no. Some Super Admins like using a "default" role that will allow them to see only the tabs for things they really care about, but either way, you can still access your full headquarters. Ed, yes, this is a common problem with groups restrictions. We've filed a development case for improvements, because it would be better if we said "any supporter added through this campaign manager record should automatically be added to their permitted group(s)", but in the meantime, I usually recommend using a specific signup page or custom form for adding new supporters, since your signup page can also automatically add those supporters to the necessary groups. Christina, this is also a common request, but we don't have these granular permissions at the moment, unfortunately. We have filed development cases recommending there be more options for permission types such as "can view but not edit", but this isn't available at this time. Is there a way to exclude someone from just one group? We have multiple groups, and instead of giving someone access to all, I would like to just exclude them from one group. Additionally, does this still give the user access to a group member if he/she searches for that person? Can we give someone "read-only" access? Hi Elizabeth - you can choose what group you want to allow that person permission to see when you create a role, see step 3 A above. A campaign manager with that role should be able to search for and view anyone that is within the group that you select. John - Unfortunately that's not a permission type yet, but we hope to improve that in the future. Chris - There's not any type of reference sheet for that as of yet, but we'll look into creating one. In the meantime, if you have a specific question, let us know over at support@salsalabs.com! Hello, I would like to be able to restrict some users on being able to see our donors giving history. What is the best way to do this? 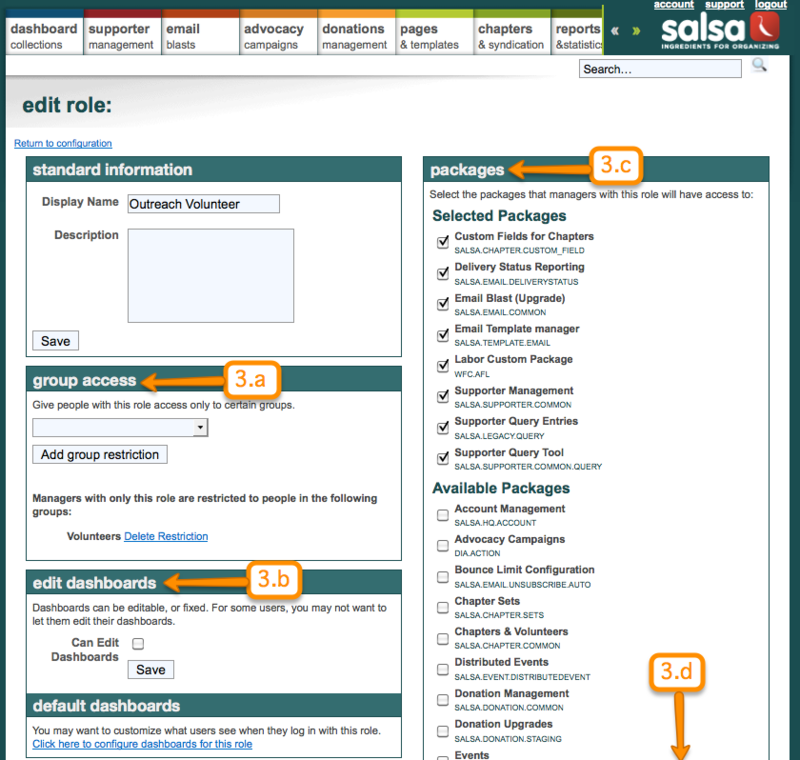 Salsa roles and permissions do not allow for that granularity of access - as stated above, you can create roles whereby certain campaign managers cannot see data related to a package, group, or tag. Creating a role which would restrict campaign managers from specified types of data within a package (in this case donor giving history) is not possible at this time. One possible solution would be to put all supporters who had never made a donation into a group and give these campaign managers access to that group only. When this is done, those campaign managers would not have access to any supporter data of donors (but this means they wouldn't have access to basic donor data such as email address and phone number). If you have further questions, please submit a support ticket for clarification. Along the lines of Christina's question above, is it possible to restrict our campaign managers from adding supporters? Rebecca, not to be cheeky, but what's the point of that? I could not seem to set a password for the new people I was adding to the account. Once I put in their names and e-mail address are they automatically notified? It's not clear whether you are adding campaign managers or supporters. If you would, could you please send a message to support@salsalabs.com? Send us details about where new people are being added, and the people that you're adding, and we'll get back in touch as soon as possible.